This charming cape-style house was built in 1966 for Harry and Mary Gadhue. They raised five children in the home and were the only owners prior to our purchasing the house in February 2005. The house was beautifully and lovingly maintained, and we could see instantly what a gem it was. Despite its good bones, it needed some updating to bring it into the 21st century. We hired Barone Construction to handle the structural changes. We spent 45 days remodeling prior to moving in on our daughter Helena's birthday, March 24th! We couldn't have done any of this without the help of family and friends. Amanda's dad, Dean, came out from Oregon to help with painting upstairs and insulation work on the mudroom. Stephen's Aunt Kris flew up from Ohio and stripped wallpaper for days on end, then helped with painting! 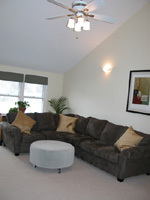 Forester Dean was instrumental in helping us make structural decisions such as raising the ceiling in the family room. He also worked almost daily during the remodel on kitchen demolition, kitchen cabinet repairs and painting, painting, painting! 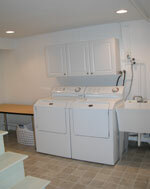 Without his energy and skills, the laundry room and mudroom would never have gotten done! After all this hard work, though, we've fallen in love with a 1966 contemporary home in South Burlington. It's on an amazing piece of land that features nearly 3 acres of pasture, woodland, wetland and rock ledge. The home's curb appeal and need for new siding will be one of our first efforts, but the interior has seen alot of recent work. We will be able to move in and focus on family and career this year. It's a home and property that will easily serve our need for a creative outlet for at least the next 30 years! This time, though, we'll pace ourselves! Select images to view slideshows. This requires that you have Macromedia Flash installed for your browser. It's free -- and safe!. 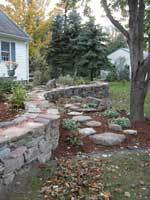 In September, Mr. Gadhue's stacked-stone wall from the back yard magically reappears in an Aschler-style wall in the front, designed and built by Forester Dean with lots of manual-labor from the family. Although the kitchen had been through at least 2 previous remodels since 1965, it was ripe for an update. 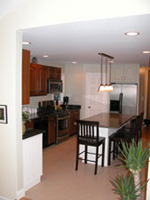 Gorgeous cherry cabinets were repaired and reinstalled. Everything else is brand new, including subfloor, wiring, lighting, drywall, flooring, appliances and granite countertops. Opening the wall between the formal living room and kitchen as well as the wall between the kitchen and family room, created a true Great Room. Garage to Great Room In the 1970s, the original one-car garage on the house was converted to a family room with only 7 ft ceilings. Opening the ceiling into attic space above created a dramatic and bright room. Now the house flows like a new-build, but retains the character, charm and quality-build of its day. Expansion and updates in the mudroom and a completely finished laundry space have transformed two of the heaviest-use family areas into havens of organization.